The gastric sleeve is transforming lives at an alarming rate. It’s popularity is due to being a relatively short procedure, having high success-rates, and minimal complications. Following the gastric sleeve diet guidelines that are set by certified surgeons and nutritionists is critical for post-op. After gastric sleeve surgery, your stomach capacity is only 3 to 4 ounces, down from 60 ounces of capacity – which makes every single piece of food important in fulfilling nutritional deficiencies that you will face after surgery. Find out how to choose a healthy goal weight after gastric sleeve surgery! The gastric sleeve diet is a high-protein, healthy fat, small-bite plan with four nutritional goals. High protein to promote healing and to minimize the loss of muscle. Moderate healthy fats as well as carbohydrates coming from whole foods such as fruits, vegetables, and legumes. Low in sugar and processed foods to prevent stalls or re-gain. Check out the Gastric Sleeve Results – What Should You Expect After VSG Surgery! Consuming the right amount of protein that will help minimize the loss of muscle and help to heal. Patients should also learn how to eat properly, which will assist them with their long-term weight loss goals. Weight loss should occur in a safe and healthy way. Next, always consume enough fluids to maintain hydration. Lastly, consume the proper nutrients through vitamins and mineral supplements throughout the day. Phase 1 of the gastric sleeve diet utilizes only clear or translucent liquids to allow for proper healing and recovery. This phase takes a minimum of two days after your operation. At first, take in very small sips at a time, about one teaspoon every 60 seconds. Then gradually increase your intake of liquids to six to eight ounces every hour. Drink very slowly and refrain from gulping. Goal of Phase 1 is to stay hydrated by consuming a minimum of 48 ounces of fluids, optimal goal 64 ounces. Sugary Drinks, Caffeinated Drinks or Carbonated Beverages are not recommended. Patients must get enough liquids to prevent dehydration. It’s important to both calculate and record your intake daily. If urine is dark in color or your mouth is dry, you are not consuming enough liquids. This diet allows a broad range of liquids and protein supplements. This will give your new pouch and digestive system time to heal properly and allow you time to adjust to your new stomach/pouch. A good rule of thumb for what is allowed on this diet is anything that has the consistency of what can easily be strained through a straw. Remember, however; at this stage, you should not be sipping anything through a straw!!!! Start taking your multi-vitamins, calcium, and iron daily as directed two to three days into phase two. 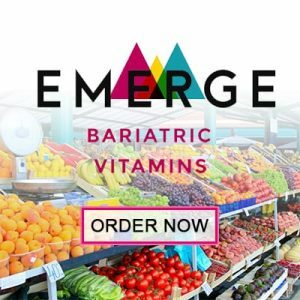 If you need guidance in this area or require vitamins, please contact us to purchase our recommended vitamins designed for your particular bariatric needs. All foods from the previous stage. Drink a minimum of 48 oz. of fluids and a goal of 64 ounces of liquids per day to prevent dehydration. Sport drink bottles with measurements on the side will help ensure you are drinking enough fluid. Remember, you will not be able to gulp liquids so you will want to drink small amounts throughout the day. During phase 2, it is important to drink a high quality, protein supplement. Your goal is 60 to 90 grams per day. To determine your protein requirements, take your ideal healthy weight and divide by 2.2. This will provide you the amount of protein you need to reach a healthy weight and maintain your lean body mass. Goal of Phase 3 is to start weighing food: 4 – 6 ounces total per meal, getting 20 grams of protein per meal (3 oz. will always be protein)- Protein first! Chew all your food well to applesauce consistency. If you don’t follow these precautions, you may experience vomiting, stomach irritation, and swelling. You could also have an obstruction of the small gastric pouch. If solid foods cause nausea and vomiting, go back to the liquid diet you had earlier. Then you can slowly add soft foods and eventually transition to solid foods. IF VOMITING AND NAUSEA PERSIST, CALL YOUR DOCTOR IMMEDIATELY. Think of your new pouch as shaped like a funnel. You can pour any liquid into this funnel, and it will run through and out the bottom. The same thing happens with your pouch when you only consume liquids. So you do not want to drink your calories or overeat. As a part of your new life, you will want to STOP drinking 30 minutes before a meal and 30 minutes after a meal. It is important to only eat until you feel satisfied and no more! to eat a high protein, low sugar, diet. Never eat and drink at the same time. Never eat more than 4 ounces of food at once. Aim for 800 calories daily. Never eat before bed and avoid any spicy food. Always check your labels before consumption of high fat, sugar or carbohydrates levels. By this stage, your stomach should be in better shape to handle solid foods. From now on, these foods are the foods you’re going to be eating for the rest of your life. Ultimately, you can consume a healthy, well-balanced diet in small portions. At each meal, you want to have at least three ounces of protein. You may wish to get a digital pocket scale to weigh your food at the start so you know what three ounces of protein looks like you will find it is easier for non-protein foods to go down, so you may gravitate to choosing non-protein foods. You want to train yourself right at the beginning to eat protein. Eat three bites of protein to everyone bite of something else (three to one rule). It is easy to get certain foods stuck, so from this phase forward, it will be imperative for you to slow down and chew your food thoroughly, pausing between bites. Remember to eat at protein first. Make sure you have three ounces of protein at each meal. Add three ounces of healthy fats, fruits, vegetables or starches if you can tolerate them. Pay close attention to how you feel with the introduction of new foods. Gastric Sleeve Surgery Diet: When you have endured gastric sleeve, you may become nausea or violently ill if you overeat. Only add ONE new food at a time! Avoid starchy food like white rice, pasta, bread. In between meals, drink at least six to eight cups of water and any other non-calorie, non-carbonated beverages. Stop drinking thirty minutes before eating and DO NOT drink until thirty minutes after a meal. EAT six small liquids and blended meals each day, but add one solid food item at one meal the first day. Add one more solid food item each day. ALL NEW FOODS NEED TO BE SOFT, COOKED OR CANNED. AVOID all raw fruit and vegetables, nuts, popcorn, pickles, olives or relishes. RECORD all new foods and any problems you have with them in a food diary and let your doctor know of any problems or questions you may have. CHEW your food very well before swallowing. The consistency of the food should be liked mashed potatoes. Make sure that each bite is very small (as if you were feeding a baby) and continue to eat small amounts slowly. Eat about two tablespoons over ten to fifteen minutes. CONTINUE to take your multiple vitamins, calcium supplements, iron and B12 supplement as directed. AVOID beverages that have alcohol or caffeine and those that are carbonated. REMEMBER, do NOT use a straw or chew gum! Important: You do not weigh your fluids; you measure by volume. You can have as many fluids as your body wants. The minimum goal is 48 ounces to prevent dehydration. Most times patients who are in weight loss plateaus can quickly adjust their lifestyle to jump off the plateaus. Patients consuming too many carbohydrates can easily be stuck on a plateau. Minimizing carbohydrates will typically break the weight loss plateaus – try exchanging carbohydrates with protein and fiber, which will keep you feeling fuller longer. If you’re undergoing a weight training program/exercise regime, you could be stuck on a weight plateau. However your plateau could be specious or not legitimate, muscle weighs more than fat and patients can easily mislead into believing they are not losing fat when they are. It’s important to look at your body to see how you’re improving. For the first 30 days, patients should not engage in strenuous activities including weight-lifting, running, or ab-crunches. We recommend that patients start by walking for 20 minutes for the first fourteen days after the surgery. After 15 days, patients can work up to 30-40 minutes of exercise per day. Swimming – Wait at least 15 days before using the tub or the pool. Wounds can easily be infected if the wound has not fully healed. Overall, swimming is an excellent exercise that can include resistance training. Weight Lifting – Wait at least 30 days after surgery to include lite resistance training. Use weights you can manage, and still incorporate cardiovascular exercise. Make sure the vitamin includes folate (at least 400 mcg daily required) and iron. Menstruating women or patients with anemia should take a multivitamin with supplemental iron. Approved Multivitamins: Centrum Performance, Flinstones, Costco vitamins, and various other brands available at stores internationally. Patients will need to supplement B12 in their diet, a deficiency is somewhat common and can lead to serious neurological problems. Patients will need to take a supplement of calcium/vitamin D complex. Supplements can help prevent osteoporosis. Approved Foods You Can and Can’t Eat After Gastric Sleeve Surgery!